Pay-Per-View Videos: Ultimate Power Challenge! 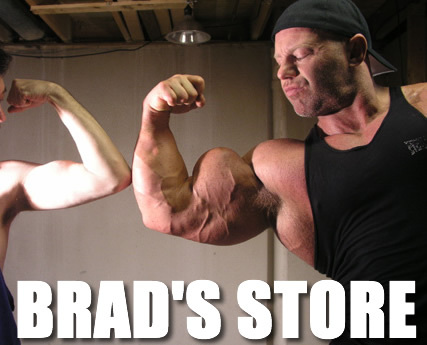 Brad takes on three bodybuilders in an all-out strength demonstration. Brad easily over-powers, dominates, and controls all three men in one-on-one, two-on-one, and even three-on-one tests of strength. These poor guys don't stand a chance when they attempt to take on Brad's monsterous 26" biceps in an arm wrestling scene that has to be seen to be believed! And when Brad slams his mind-blowing massive chest against these guys when they are pinned to the wall, you know there is no hope for them. Brad is victorious in each test of his legendary strength and the three bodybuilders are left piled on the floor with Brad flexing over their defeated bodies. Brad's incredble mass just dwarfs these bodybuilders - it's like children trying to wrestle a supertanker! Can anyone withstand the awesome power that is Brad Hollibaugh?